The jal tarang (Hindi: जल तरंग, Urdu: جل ترنگ), jaltarang, jal-tarang, jal-yantra, jalatarangam or jalatharangam is an Indian melodic percussion instrument. It consists of a set of ceramic or metal bowls tuned with water. The bowls are played by striking the edge with beaters, one in each hand. The earliest mention of the jal tarang is found in Vātsyāyana’s Kamasutra as playing on musical glasses filled with water. It is one of the 64 Arts and Science to be studied by a maiden. In modern times, it has fallen into obscurity. Literally, jal tarang means “waves in water” but indicates motion of sound created or modified with the aid of water. In the wave-instruments, it is the most prominent and ancient instrument. 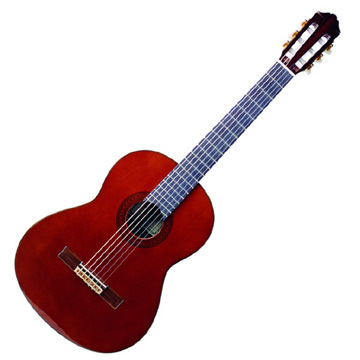 This traditional instrument is used in Indian classical music. Some scholars think that in the ancient period these were in routine use around the eastern border of India. Jal-tarang finds its first mention in Sangeet Parijaat. This medieval musical treatise categorizes this instrument under Ghan-Vadya (Idiophonic instruments in which sound is produced by striking a surface, also called concussion idiophones.) 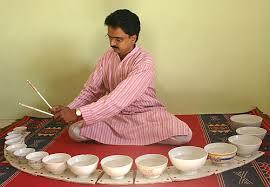 SangeetSaar considered one with 22 cups to be complete jal tarang and one with 15 cups to be of mediocre status. Cups, of varying sizes were made of either bronze or porcelain. Today only china bowls are preferred by artistes, numbering around sixteen in normal use. Cups for Mandra Swar (notes of lower octave)are large while those for Taar Swar (notes of higher octaves) are smaller in size. Water is poured into the cups and the pitch is changed by adjusting the volume of water in the cup. The number of cups depends on the melody being played. The bowls mostly are arranged in a half-circle in front of the player who can reach them all easily. The player softly hits the cups with a wooden stick on the border to get the sound. It’s not easy to tune the instrument and needs some skill. During playing fine nuances can be reached if the performer is accomplished. SangeetSaar mentions that if the player can rotate the water through a quick little touch of the stick, nuances and finer variations of the note can be achieved. Jal-tarang was also called jal-yantra in the medieval times. Poets of Krishna cult (also called Asht-chhap poets) have mentioned this instrument, but there is no mention in literature prior to this. Some contemporary Jal-tarang players of Carnatic music do attempt to produce Gamak often in the face of sounds going awry lacking required control. George Harrison played the jal-tarang on the title track of his 1982 album Gone Troppo. In India, Seethalakshmi Doraiswamy is an accomplished Jaltarang player.